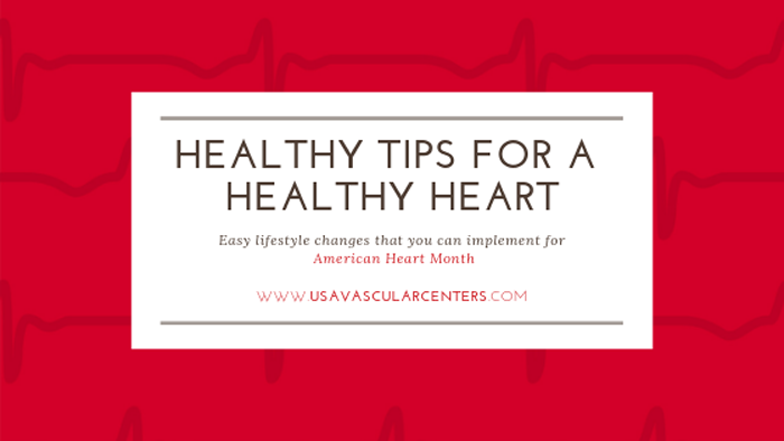 American Heart Month focuses on raising awareness of heart disease, while promoting healthy living tips and tools that you can use in your daily life. Making small lifestyle changes can help prevent vascular disease such as peripheral artery disease and coronary heart disease. Stop smoking– Smoking contributes to atherosclerosis which is a major cause of Peripheral Artery Disease (PAD). PAD is a progressive circulation disorder that can cause amputations, blood clots, and even death. Get active and exercise– Physical activity not only helps prevent heart disease, but it also can improve your overall mental and physical health. Lower your stress– Easier said that done but it will lower your risk factor for heart disease. Stress increases cortisol, which causes weight gain, and can lead to other unhealthy habits. Know your numbers– Maintaining a healthy weight, blood pressure, and total cholesterol can help prevent heart disease and PAD. Very speed during aerobics – Varying your speed and intensity during aerobics can blast boredom and give your metabolism a boost. Building up your speed and intensity slowly helps reduce the chance of quitting your workouts early. Learn your family’s medical history – Being knowledgeable about your family’s medical history can save your life. Ask your relatives and do some research on what familial conditions, like vascular disease, run through your lineage. Being able to document and notify your doctor can help prevent future health risks. Visit the doctor – Studies have concluded that 40% of people in their 50s and 60s did not attend a yearly physical. Visiting the doctor can help prevent future health conditions by catching any issues or symptoms early. Annual physicals can monitor your blood sugar and pressure, as well as your cholesterol levels. Get enough sleep – Sleeping can help you stay at a healthy weight, lower your risk of diabetes and heart disease, and reduce overall stress. Get between 7 – 8 hours every night. Don’t drink your sugar – Drink more water and skip sugary beverages, especially ones with high fructose corn syrup. Many juices, teas, and energy drinks sneakily put in corn syrups replacing actual sugar. Eat nuts and beans – Nuts and beans are a significant protein resource. They assist with heart health, reduce the risk of cancer, and help in preventing diabetes. Avoid processed lunch meats – Lunch meats, especially those that are pre-packaged, are filled with harmful chemicals and nitrates that are linked to certain cancers, diabetes, and vascular disease. Recent studies have shown that eating over processed lunch meats are worse than consuming red meat such as steaks or burgers. Cook with olive or avocado oil – Avocado oil reduces cholesterol, improves overall heart health, has many antioxidants, as well as help prevent arthritis and gum disease. Cooking with olive oil is rich in monounsaturated fats, antioxidants, anti-inflammatory properties, and can help prevent strokes or heart attacks. Lift to your ability – Lifting even five to 15 lbs. can improve circulation throughout the body. Go slowly, and watch yourself in the mirror to make sure you are lifting properly and not with your back. Stretch your limbs – Stretching can be used to lower stress, as well as improve circulation through the muscles and limbs. Stretching 15 minutes a day in front of the tv, computer, or before housework decreases your chance of injury and helps focus your mind. Socialize frequently – Close friendships, family ties, and relationships improves both mental and physical health. Some of the benefits include: lower stress, decreased blood pressure, improved immunity, and can even help prevent dementia. Don’t sit all day at work – Sitting all day at work can hinder healthy circulation as well as decrease overall brain function. Standing and light walking around work helps lower your risk of vascular diseases, type 2 diabetes, and chronic back pain. Say goodbye to the beer belly – Having a “beer belly” or larger front abdomen increases your risk of cardiovascular disease, sleep apnea, high blood pressure, and type 2 diabetes. Eat eggs at least twice a week – Eggs are an inexpensive way to get protein, vitamin B2, healthy fats, vitamin D, and other minerals. New studies have shown that people can eat up to eight eggs per week without increasing the risk for vascular diseases. Avoid the egg yolk if you want to stay away from added cholesterol, and remember, don’t add too much salt! Increase your intake of rich omega-3 fats – Omega-3 fats are linked to improved heart and brain health. They can also improve skin health, which comes in handy if you are struggling with ulcers or thick, hardening skin. Peripheral artery disease (PAD) occurs when plaque, extra fats and cholesterol, circulating in the blood collect in the walls of the arteries. This accumulation of plaque blocks the flow of blood to your limbs. Early treatment of PAD can restore your mobility, decrease your risk for heart attack and stroke, and possibly save your life. Often, people experiencing symptoms of PAD–like pain or cramping in the legs–do not report it because they think it is a natural part of aging. If you’re over the age of 50, have high cholesterol or blood pressure, or have a family history of vascular disease, give us a call 888-773-2193 or visit our website to schedule an arterial check-up today. Follow us on Twitter www.twitter.com/USAVascularCntr or Facebook www.facebook.com/usavascularcntrs/ for up-to-date information regarding our medical team and treatment centers.